Created and produced by the RFA Technical Committee and RFA Technical Director Martin Mitchell, the RFA Food Safety Training DVDs cover critical topics and tasks to help refrigerated plant workers ensure food safety. 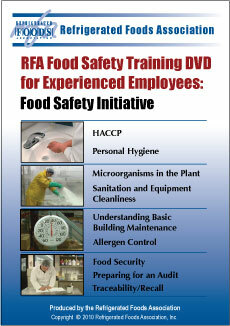 The original RFA Training DVD, titled "Operation Food Safety: Everybody's Mission," was produced in 2007 and is geared toward entry-level plant employees. The second program is the RFA Food Safety Training DVD for Experienced Employees which offers more advanced training for mid-level, experienced plant employees and supervisors. Please scroll down for information about both DVD training programs and information on how to get your copies. Additional copies are available for $225. For a full description and information on how to get your copy, please read below. employees should know about third-party audits, food defense and allergens. and co-sponsored by RFA member companies Certified Laboratories, Inc.; IPL, Inc.; and Ecolab, Inc.
through Silliker, Inc., the authorized distributor of the RFA DVD. Safety Training DVD for Experienced Employees! 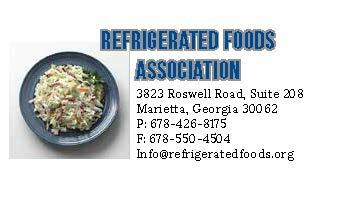 For questions, please contact the RFA office at 678-426-8175. RFA Food Safety Training DVD - "Operation Food Safety: Everyone's Mission"
and ready employees for further training in plant specific policies. challenging – but winnable – battle to prevent foodborne illness and disease. employees are given tangible, everyday examples of key food safety principles and practices. knowledge in each session after training. of the RFA DVD. Members of the RFA will receive one copy of the RFA Training DVD and CD manual free of charge. Click here for information on how you can become a RFA member and receive a free copy of the RFA Training DVD! (The RFA Training DVD is listed under "Plant Sanitation"). The DVD format is appropriate for US and Canada. For use in other countries, you will need a DVD player with Multi-region capabilities.